Well, it’s that time of year where we sneak in a last break before school starts up again (Yay! School is finally on the horizon). This time around, we headed north to Vermont and spent a week in the great outdoors at Smugglers’ Notch. As a means to wash away the days spent swimming, hiking, canoeing, and human foosballing (yes, that’s a thing), I found several liquid refreshments to restore my strength. 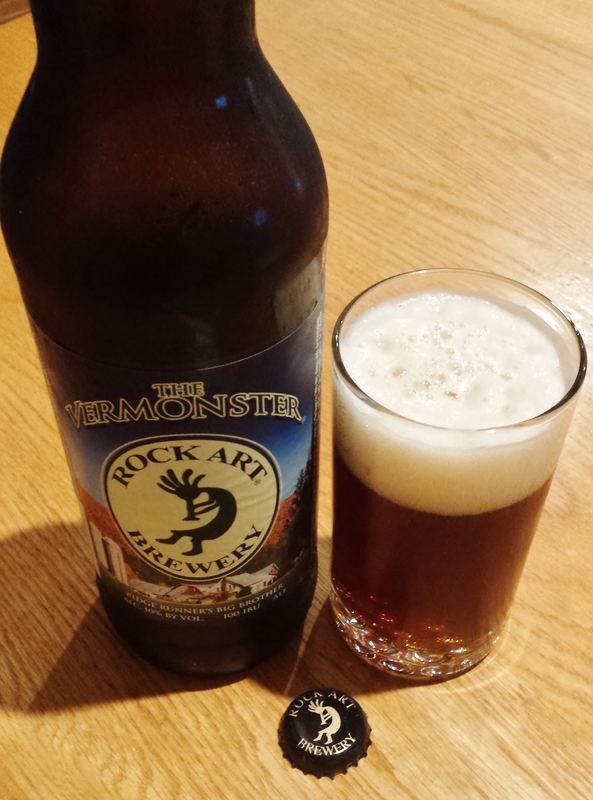 One such bottle was the Vermonster, an American barley wine from the Rock Art Brewery. Rock Art Brewery was founded in Matt Nadeau’s basement in Johnson, VT in 1997. Today, the full-fledged brewery operates out of a facility in Morrisville, VT. They currently produce 19 beers in bottles and are distributed throughout Vermont, Massachusetts, Connecticut, Arizona, Pennsylvania, Maine and New Jersey. If you happen to be in Morrisville, you can pick up a firkin or a cask ale on special order. Appearance: A coppery brown with lots of tan foam. Aroma: Malty and doughy with lots of hops (apricots & lemons) with hints of coffee. Taste: Mostly hoppy with hints of malt and coffee grounds and a slightly bitter aftertaste that is more from the hops than from the coffee grounds. I pulled this bottle right out of the fridge and I didn’t find it to be all that much of a barley wine. Maybe it was too cold or maybe it was all the hops and malt, but I didn’t find the typical boozy characters (stone fruits, grape must, etc.). Instead I found a hoppy hodgepodge (in a good way) of flavors that left me wanting for more. I’m not a big fan of barley wine but this one was really nice. As it warms, it takes on a little bit more of a barley wine character but still has enough other flavors to remain interesting. If you are lucky enough to find this in your bottle shop, I recommend giving it a try. Whisky News Flash: Fall 2015 Whisky Extravaganza Schedule and a Promotional Code! So you’re saying this is better than that Jasmine Pale Ale we had a few years back? What isn’t better than that Jasmine Pale Ale. The bottle was awfully pretty, though. I think you would like the Vermonster as the big flavors are in your wheelhouse.